Temperatures are hitting record lows in parts of the country this week. In preparation for the snow and cold, check out our winter safety tips for people with disabilities. 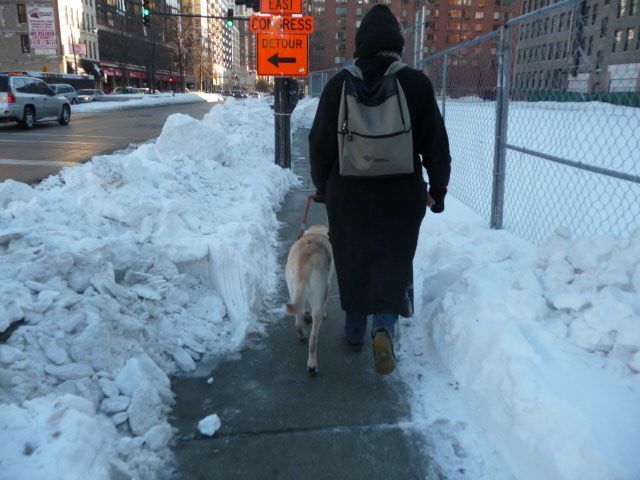 When sidewalks are covered in snow and ice, walking to work — or to school, or just to exercise — can be difficult. Or impossible. A growing number of people who simply choose not to drive. For guide dogs, everything can look like a tunnel sometimes. Those of you stuck at home in the aftermath of a snowstorm may want to use your time inside to communicate and educate transportation professionals and community leaders about snow removal and accessibility. Easter Seals’ Project Action has developed a guide related to transportation and snow removal. The 24-page booklet highlights innovative policies and strategies used by U.S. and Canadian communities to improve accessible pathways and transit stops during winter weather. Happy reading, and hang in there — it’s gotta melt sometime.